yourFXguide-Currency trading is a war, and in order to win in this war traders need to have as many weapons as they can have. Candlestick chart patterns are such weapons which can turn a trader into a winner, if they are applied successfully. In the retail forex trading industry, you will have so many traders who believe that studying the currency trading is just waste of time and not worthy enough to make profitable trades. They believe currency trading is similar to gambling. But they want to make profit from their trades. I say, currency trading is a brain game, and It is not for the common people. Currency traders need to have some specialty. However, this post is written to explain the technique to apply the wolfe wave analysis to trade the symmetric triangle. In my previous post I already mentioned that candlesticks chart pattern can be traded in a very effective way, applying the wolfe wave analysis. How do we draw a symmetric triangle on candlestick chart ? and How do we trade it? We generally draw a symmetric triangle on a price chart drawing some straight lines through some support and resistance levels. Actually, such chart patterns portrait the war between demand side and supply side in a market. And the breakouts of such patterns announce the winner in the war. We traders enjoy this war and support the winner. When a breakout takes place in a symmetric triangle, traders generally place an order. This is the commonly practiced technique of trading the candlestick chart patterns. In the above real price chart, we got a symmetric triangle pattern, and we marked the different waves within the pattern. 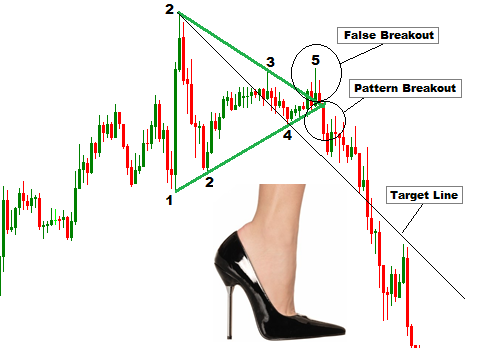 Traders who only know the pattern breakout trading technique to trade a symmetric triangle pattern will place an order when the price breaks the upper line of the triangle. But the traders who know the wolfe wave analysis will identify this breakout as false breakout. I will recommend my previous post on Wolfe Wave Analysis to be read before this post so that you can easily understand what I am talking about. I will never place an order when the false breakout of a symmetric triangle takes place rather I will place an order when the breakout takes place according to the Wolfe Wave Theory.